When RMS Titanic sailed out of Southampton on April 10 1912, she was hailed as the world’s most luxurious liner. Her state of the art features surpassed those of competing vessels, cementing White Star Line’s status as Britain’s finest shipping company. Yet like any industry, there have been some significant developments over the past nine decades. In fact, this year will see the launch of Royal Caribbean’s Quantum of the Seas (see below), a vessel that has been pegged as the world’s first ‘smartship.’ Packed full of next generation technology from bow to stern, it offers passengers an at sea experience like never before. If you’re interested in finding out more about how contemporary vessels differ from their classic predecessors, read on for a comprehensive guide to modern cruise ship advancements. Despite a name that means ‘gigantic’ in Greek mythology and a reputation as ‘the biggest ship ever built’, Titanic was relatively modest in size compared to today’s ultra-modern megaliners. Measuring 882 feet in length and weighing just over 46,000 tonnes, Titanic was a giant of her time. Yet today, Allure of the Seas blows her proportions out the water, measuring in at 1187 feet in length and a huge 225,000 tonnes in weight. Allure also towers above Titanic, clocking in at 236 feet spread across 19 decks. That’s a huge 124 feet taller than the Eiffel Tower! In comparison, Titanic was 175 feet tall and housed just nine decks. While size does matter to some people, others prefer the intimate feel of small ship cruise lines such as Azamara Cruises, Celebrity Cruises or Silversea Cruises. Contemporary cruising offers the best of both worlds! While size differs quite significantly, maximum speed is surprisingly unchanged. In fact, Titanic actually sailed faster than Allure, capable of doing 24 knots compared to Allure’s 22.6. Back in 1912, Titanic’s steam engines were state-of-the-art. By comparison, modern day cruise ships run on gas turbine or diesel electric engines. On the opposite side of the spectrum, a glimpse at Quantum’s new engines reveals something that’s verging on space age! 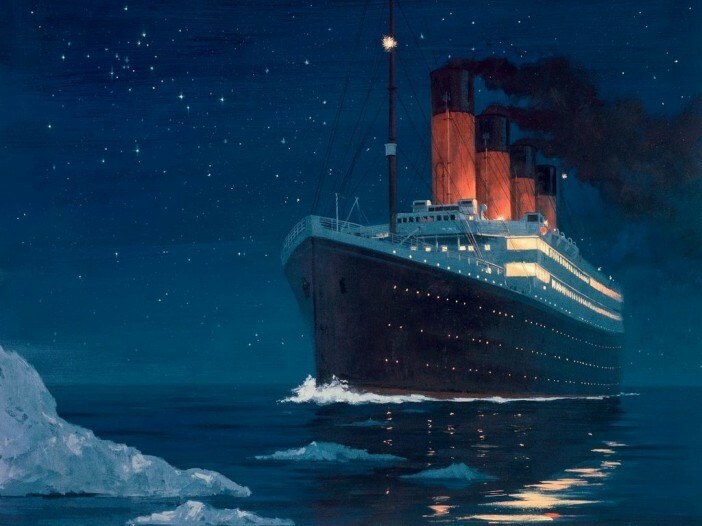 One of Titanic’s most tragic downfalls was the lack of lifeboats. Despite a total capacity of 3327 passengers and crew, the 46,000 tonne Olympic class ocean liner housed just 20 lifeboats. At full capacity, these boats were capable of carrying 1178 passengers. As a result, Titanic’s fatal iceberg collision resulted in the deaths of over 1500 people, a disaster which is referred to as one of the deadliest peacetime maritime disasters in history. Thankfully, today’s modern cruise ships are governed by stringent health and safety laws. If you embark on a cruise, you can rest assured that the vessel is equipped with enough life boat space to house every passenger and member of crew. While International Convention for the Safety of Life at Sea (SOLAS) equipment regulations state that lifeboats should cap capacity at 150 people, Royal Caribbean’s Oasis of the Seas is the first ship to boast next generation 370 person ‘mega lifeboats’ featuring a robust catamaran hull and dual 70hp diesel engines. SOLAS and the International Life-Saving Appliance Code (LSA) also dictate that every lifeboat used in international voyages should be equipped with an Emergency Position-Indicating Radio Beacon (EPIRB) as well as a radar reflector or Search and Rescue Transponder (SART). This ensures that in a worst case scenario, lifeboats can be easily located by search and rescue teams. In the 1900s, passengers embarking on cruises resigned to disappearing completely off the radar. For first class passengers, wireless telegraph was available, however this was also used by the crew for ship operations. When Titanic hit the iceberg, the only way to call for help was to send out a wireless distress signal, issue Morse light codes and launch flares in the hope that a nearby ship would respond. In comparison, today’s communications technology is state-of-the-art. Most ships are equipped with Wi-Fi and while access previously set passengers back an arm and a leg, smartships such as Quantum now boast lighting fast bandwidth powered by low mid-earth orbit satellites. This is set to slash costs, boosts speed and keeps passengers connected and entertained around the clock. Bill Martin, VP and CIO at Royal Caribbean explains, “As a result, Quantum of the Seas will enjoy more bandwidth than every other cruise ship from every cruise line combined. This technology simply didn’t exist in July, let alone several years ago.” In-cabin phones allow cruisers to get in touch with fellow passengers and crew at the touch of a button, while some lines even rent out iPhones to help with reservations, shore excursions and keeping track of the kids! After the Titanic disaster, the Radio Act of 1912 was passed which dictated that all passenger ship radio communications must be operated 24/7. In case of emergency, modern day cruise ships also have access to satellite phones and internet connectivity, which ensures that the alarm is raised in a matter of seconds. As expected, the on-board amenities of modern day cruise ships far surpass those seen on-board the Titanic, as well as her Golden Age forerunners such as the RMS Queen Elizabeth. While Titanic offered passengers just one on-board swimming pool, ships such as Oasis of the Seas house over 20 aquatic amenities, from outdoor pools to indoor Jacuzzis. Contemporary cruising is a gastronome’s paradise, with many ships housing in excess of 20 dining options serving up everything from takeaway snacks to five course gourmet meals. But ships such as Navigator of the Seas definitely live up! As far as entertainment goes, on-board activities have evolved to suit passenger preferences. In 1912, Titanic passengers could entertain themselves with Turkish Baths, libraries, cafes, smoking rooms and piano recitals. Today, on-board entertainment has been taken into the 21st century. On-board Royal Caribbean’s Quantum class ships, passengers can find thrilling activities such as a RipCord by iFLY skydiving simulator, FlowRider surf machine, ice skating rink, rock climbing wall and bumper car track. Celebrity treats its passengers to indulgent Canyon Ranch SpaClub facilities, Royal Caribbean puts on Broadway style musicals and Norwegian has won countless industry entertainment awards for enlisting performances such as the Blue Man Group. If you’ve been wowed by the developments in modern day cruising, why not check out some of the incredible deals on offer from Cruise 1st or talk to our team today on 1300-857-345? Whether you want to experience the next generation technology of Quantum of the Seas of embark on an intimate journey on-board Silversea’s 296 passenger Silver Cloud, Cruise 1st boast budget friendly deals from all of modern-day cruising’s leading lines. Images sourced via Wikimedia Commons and Royal Caribbean Press Center. Credit: Wikipedia and Royal Caribbean.